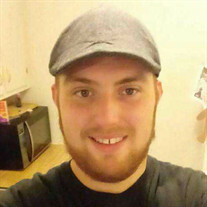 Michael Darryl Browning, age 22, of West Columbia, SC, formerly of Rutherfordton, died Monday, December 19, 2016. He was the son of the late Marvin Darryl Browning. In addition to his father Michael was preceded in death by his maternal step-grandfather Buddy Salmon. Mother Angela Owens Browning (Steven Bennett) of West Columbia, SC. Stephen Browning of West Columbia. The family will receive friends from 12:00 PM till 2:00 PM Friday, December 23, 2016 at McMahan's Funeral Home. The funeral service will be 2:00 PM Friday, December 23, 2016 at McMahan's Funeral Home Chapel with Reverend Doug Carpenter officiating. In memory of Michael the family requests you wear purple. Interment will take place at Eternal Hills Memorial Park.